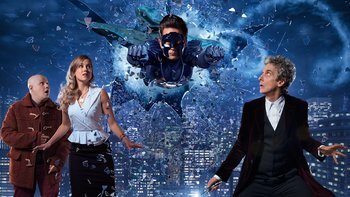 Recap / Doctor Who 2016 CS "The Return of Doctor Mysterio"
You'll believe... that there is an actual superhero in a show like Doctor Who.note From left to right: Nardole, Lucy Fletcher, the Ghost/Grant Gordon and the Doctor. Click here to see the Radio Times magazine poster for this episode: "In a comic book, you know what you'd be called? Doctor Mysterio." Grant (child): What's happened to me? The Doctor: Intuitive crystal, plus too many comic books. The gemstone is giving you what it thinks you want. YOU'RE A SUPERHERO! The one with Goku. As Superman. Except one is Old Shame, and the other is Captain Ersatz. And no, they're not fighting each other, either. Or having a rap battle. Written by Steven Moffat. The 2016 Doctor Who Christmas Episode. Once upon Christmas Eve 1992 in New York City, the Twelfth Doctor got himself into a pickle while trying to correct some of the time disturbances affecting the city, and found help in young Grant Gordon. A subsequent misunderstanding involving a mystical gem resulted in the comic book-loving boy being granted the thing he seemed to want most in the world — superpowers. Twenty-four years later, the Doctor and old acquaintance/new companion Nardole are back in N.Y.C. They're investigating Harmony Shoal, a seemingly benevolent corporation actually masterminded (so to speak) by sentient, alien brains that are seeking human host bodies. It turns out that they aren't the only ones suspicious of the company; so is Lucy Fletcher, an investigative journalist. And the Doctor isn't the only extraordinary being on the side of good in this situation — it turns out that Grant Gordon has decided (heedless of the Doctor's orders never to do so) to use his amazing abilities in public as the mysterious masked vigilante, The Ghost. These two heroes will ultimately have to work together not only to save the planet, but also to come to terms with their responsibilities to themselves and those close to them. Watch the exclusive "Children in Need" clip that premiered on November 21st, 2016 here. There's also the official trailer here and two "behind the scenes" looks here and here. Adorkable: Out of costume, Grant Gordon is a sweet and caring guy with a love of comic book superheroes. Alliterative Name: Grant Gordon (apropos for a superhero) and Lucy Lombard. Grant: No one touches that child! Always Someone Better: Inverted, as the Doctor takes heart that there is at least one person in the universe worse than he is in regards to romance. Ambiguous Syntax: The cause of Grant's superpowers; the Doctor gave him a glass of water, a crystal, and said "take this", meaning to hold it. Grant thought it was medicine and swallowed it. Appropriated Appellation: Downplayed, while he doesn't start calling himself that, the Doctor admits he'd like to be called "Doctor Mysterio". And Starring: "And Matt Lucas". Especially strange, as he's the only actor billed in the opening apart from Peter Capaldi.note It's a position generally reserved for companions. Ascended Fanboy: As a child, Grant Gordon had his room plastered with superhero decor. He then became a superhero. Assurance Backfire: When they are on the Harmony Shoal ship and Nardole is being attacked the Doctor's reaction is "Oh, you'll be fine. This ship will have blown up long before you've been strangled to death!" Awesome, but Impractical: Members of the Shoal like to use their heads to store things. ("Brock" keeps a gun in his, and in the previous special another member kept the money orb in his.) While this is incredibly effective for the purpose of intimidation and creeping out your victim, retrieving anything is extremely slow and difficult, thus making it useless for surprising anyone - "Brock" was fortunate that none of his victims took the opportunity to just step forward and stop him while he was digging it out. It also exposes their most vulnerable spot, and it leaves the object covered in brain-goo, which can't be too good. Babies Make Everything Better: Jennifer, Lucy's daughter. Averted, as after Mr Lombard finding out she was pregnant he left her. The Doctor tells the Harmony Shoal that his statement of "mercy" wasn't a request, but an offer. He goes on to add that not one successful invasion of Earth has ever been executed. Sim mocks the humans for having no plan to stop his Evil Plan. The Doctor replies that they don't need a plan when they have him. Later "Brock" tries to tell the Doctor that the vengeance of the Harmony Shoal is known and feared across "The five star systems". The Doctor dismisses him with Blah Blah Blah, telling him that he has to go change Lucy's baby, because "you're not the only one who's full of it." The Doctor considers a race that is feared "across five star systems" to not even be worth his time, so he doesn't even bother with the You Have No Idea Who You're Dealing With speech like he gave the Racnoss. When Lucy finds out about Grant's dual identity, she tells him she prefers him in his superhero outfit — by which she means the everyday clothes he wears when he's being Grant Gordon, Ordinary Kind Human Being. At first it looks like Brock will be the standard Corrupt Corporate Executive Big Bad, but he's quickly revealed to be an Unwitting Pawn when he gets his brain swapped out. Bat Deduction: Lucy working out the Doctor knows the Ghost's secret identity does take some leaps in logic. Bat Signal: The Ghost has a beeper ... to let him know when the baby is crying. Bavarian Fire Drill: The Doctor claims he's Special Agent Dan Dangerous from Scotland Yard, Scotland... even though Scotland Yard isn't in Scotland. However, Lucy quickly sees through this. Brain in a Jar: The aliens are kept like this in Harmony Shoal, until they can be given a host. Brain Transplant: The aliens have their brains transplanted into human hosts by a team of scary surgeons. Body Snatcher: The aliens have themselves transplanted into a human, replacing their nervous system and using them as a vessel. Bond Villain Stupidity: Lampshade by the Doctor. "Oh, you told me something there! You told me something. You shouldn't have done that!" Breather Episode: This gentle but affectionate tribute to comic book superheroes is another relatively rare example of this trope for the Twelfth Doctor, even as it acknowledges post-River Song melancholy on his part. It's justified in that besides being a Christmas Episode it was the first new Who episode to air in a full year, due to Series 10 being pushed back to Spring 2017, and a continuity-dependent episode might have been lost on casual viewers. Bridal Carry: The Doctor finds himself upstaged for once when the Ghost does a Big Damn Heroes, then carries off the Damsel in Distress this way. Brought to You by the Letter "S": The Ghost has a big "G" on his superhero outfit. Bruce Wayne Held Hostage: Grant becomes one of the aliens' hostages in their attempt to draw out the Ghost. Call-Back: The Harmony Shoal made a short appearance in the previous episode. Now, we learn the hard way that those slit-headed folks were actually all victims to parasitic aliens. The Doctor turns out to be still be brooding about having to say goodbye to River Song for the last time from his perspective, but is also trying (perhaps too hard!) to move on to a new chapter in his life. Compare that to the last time he lost someone he loved. It seems that over 24 years of sharing King Hydroflax's robot body with Ramone mostly cured Nardole of being The Ditz — he's now quite the Deadpan Snarker (most of it comes from putting up with the Doctor's BS), and he apparently ruled Constantinople "firmly but wisely". Dr. Sim's comment that the Harmony Shoal building can survive an atomic blast. He thoughtfully repeats it later when the Chekhov's Gun is fired. Harmony Shoal has branch offices in every capital city in the world and New York City. It's Nardole who points out that NYC is not a capital city — and that becomes very relevant indeed. Christmas Episode: The twelfth for this series, though unlike the last several specials, Did I Mention It's Christmas? applies. Child!Grant thought the Doctor was Santa Claus initially. Grant's disguise as the Ghost is just a mask and a deeper voice; only slightly more effort than Clark himself put into it. To Grant's credit, his mask covers more of his face than most comic book heroes put effort into, and he adopts different mannerisms and change his hairstyle much like Christopher Reeve did. He's just not as good at it. Lampshaded in the first sequence when the Doctor giddily discovers that Clark and Superman are the same person (he draws glasses on Superman's face to prove it). When Grant scoffs that everyone knows that already, the Doctor defensively points out that Lois Lane, an investigative reporter, hasn't caught on yet (foreshadowing Lucy's cluelessness later on). When young Grant tells his mother there's an old man outside the window requesting entry on Christmas Eve, she naturally assumes he's referring to Santa, and gives the requisite milk and cookies. When a doctor hands him a glass of water and something that looks like a red pill, young Grant swallows it, thinking it's medicine. Nardole asking for the little boy's room, during a press conference. The Doctor offers a burger to Dr. Sim, who responds as if it's some kind of deadly device. Nope, it's just a burger. Companion Cube: Mr. Huffle the stress toy. He feels pain. The Doctor says that the device he built on Grant's roof is meant to stabilize time distortions in New York City, and notes that they're mostly his fault. Nardole has had his head reattached to his body, and is now traveling with the Doctor. The brain aliens are also the Shoal of the Winter Harmony (the Hydroflax worshippers from the episode Nardole first appeared in). The Doctor reacts when Grant says that he's known Lucy for twenty-four years, the same amount of time he had with River on Darillium. The Doctor mentions several times that he always brings a snack along on his capers, which is something his previous incarnation did. The Doctor loses his appetite on seeing a member of the Shoal of the Winter Harmony opening their head. The Doctor tells the aliens to "get off this planet." Nardole tells Grant and Lucy about River, and how she died "a very long time ago in a library." At the end of the episode, Lucy asks Grant the Question (as usual, doubling as a Title Drop). The Doctor thanks the universe for showing him someone who is worse at romance than he is. And not less important, it's not the first time the Doctor goes to the United States (San Francisco vs. New York). Contrived Coincidence: During their date, the Ghost takes his mask off to reveal to Lucy that he's Grant, but her face just happens to be turned away the entire time. Cool and Unusual Punishment: Lucy tortures a little stress toy to intimidate the Doctor, which amazingly works. Deadpan Snarker: Nardole and the Doctor, as well as the Ghost when he's in character. The Ghost: [After breaking a giant window mid-air by knocking on it once] Mind if I come in? Dr. Sim: Impressive. Those windows, like everything in this building, are built to withstand a blast equivalent to four nuclear explosions. The Ghost: Sorry about that. Would you like me to call a glazier? The Ghost: Please understand that it is against my personal code to cause lasting harm to any individual. [The Ghost then pushes Dr. Sim back with such force that he slides on the floor and knocks himself unconscious on a wall] However, light to moderate injury is fine. Dead Person Impersonation: The Shoal of the Winter Harmony remove people's brains and take them over. They plan to do this to the leaders of Earth, enabling them to conquer humanity in one fell swoop. Decoy Leader: Mr Brock, Head of the New York branch of Harmony Shoal. He doesn't even know about the real leaders of the Company until his body is taken over. The Shoal plan to take over Earth by making the most powerful humans this. Did I Mention It's Christmas? : The only real element of Christmas in the episode is the opening scene where Grant first meets the Doctor, and it happens to be on Christmas Eve. Didn't See That Coming: Dr. Sim and his cohorts from Harmony Shoal have everything planned out. However, they didn't anticipate the Doctor jump-starting their scheme, forcing them to reveal their hand early and exposing their operation. Disappeared Dad: The real father of Lucy's baby walked out on his wife when she announced she was pregnant. He's long since gone from their lives. The Doctor: Do you know what a lightning conductor is? The Doctor: Well, it's not like that. Dissonant Serenity: The Doctor has become so blasé about breaking-and-eavesdropping on an Evil Plan, he brings sushi along so he can have a snack. Dogged Nice Guy: Grant is this to Lucy, even becoming her nanny when her husband (his former best friend) abandons her after she becomes pregnant. The Doctor even calls him out on this and asks him if he's taking care of Lucy's baby just so she can go out and get her rocks off with some other guy. Dragon-in-Chief: An odd variation. Mr Brock thinks he's the Head of the New York branch of Harmony Shoal, not realizing its true agenda. Dr. Sim then has Brock's brain removed and replaced with one of the Shoal. The End... Or Is It? : The invasion plan is foiled and UNIT takes control of the Harmony Shoal's Head Office... but the brain in Dr. Sim takes over a UNIT soldier. Evil Plan: The Shoal's invasion is so well-planned even the Doctor appreciates that. The Doctor: [dramatic music] In one day of terror, the executive authority of Planet Earth will pass to Harmony Shoal. [music stops] It's a good plan, I like it. How come our side never gets plans like that? Evil Tower of Ominousness: The Harmony Shoal Offices built in any capital city and New York. These actually turn out to be significant to the Evil Plan. Grant/The Ghost is a walking bundle of superhero cliches, most notably of Superman. He also takes after Batman being a nighttime superhero with a Bat Signal, while his Geeky civilian identity is not unlike Peter Parker. Similarly, Lucy is a Lois Lane archetype being the reporter/love interest/etc. Eye Colour Change: When someone's body is taken over by the aliens their eyes occasionally change color. Face Palm: Lucy does this after her Love Epiphany, so she doesn't notice that Grant has taken his superhero mask off. By the time she looks up, Grant has chickened out and put it back on again. Face Stealer: The alien brains kill their victims then replace their nervous systems to control them. False Flag Operation: The aliens have a ship in orbit rigged as a giant bomb, ready to obliterate New York. Harmony Shoal has been reinforced to survive the blast. All the world's leaders will flock to it for refuge, and come back out taken over by the aliens. "We're here to open your minds." "The operation is swift and quite painless. [beat] You realise I'm talking to my colleague in the jar?" "Oh don't worry! The ship will have blown up long before you've been strangled to death." Genre Refugee: The Ghost is a straight comic book superhero in the far less superheroic Doctor Who setting. Getting Crap Past the Radar: Literally, when even a Christmas episode has poop jokes. The Doctor hopes that Grant's superpowers will pass when the crystal ... passes. When young Grant tries to deny that Lucy is his favourite of the people he sees naked, he levitates with his hands over his crotch. When going to change the baby's nappy, the Doctor tells Brock he's not the only one who's full of it. Glamour Failure: Dr. Sim's eyes occasionally flicker sideways and change colour, and blue liquid drips from his nose. The eyes do this at the end to demonstrate the Shoal brain has taken over another body. Glowing Eyes of Doom: Occasionally the eyes of those whose bodies have been taken over by the Shoal do this. Good Scars, Evil Scars: It's actually fairly easy to spot a Harmony Shoal member, given the diagonal scar across their faces where their heads open up. Grand Theft Me: The modus operandi of the alien menace, who swap themselves into human hosts while removing their brains. Green-Eyed Epiphany: During her date with the Ghost, Lucy realizes that she's jealous that Grant had a date scheduled for that night too (not realizing that he is the Ghost). Hand Wave: About two-thirds into the episode Nardole explains how he got his body back after he lost it in the previous episode, namely that the Doctor fixed him. Hero of Another Story: Nardole ruled Constantinople "firmly, but wisely." Herr Doktor: Dr. Sim has a German accent. Homage: The entire episode is an obvious one to superhero movies and comic books with the Ghost being an Expy to Superman. Steven Moffat says this is because he loved superhero movies and comic books as a child. Hostage for MacGuffin: After Lucy starts associating with the Ghost, she inevitably gets held hostage by the villains to force the Ghost to give them what they want, which in this case is his own superpowered body. Hormone-Addled Teenager: Teenaged Grant refuses to look at anyone and instead stares at the floor because the gemstone is being influenced by his puberty. It gave him X-Ray vision that is always on. Hurl It into the Sun: The Doctor suggests that the Ghost dispose of the giant bomb at the end by tossing it into the sun as he ascends into the sky. Hyper-Awareness: Grant. The Doctor at one point broadcasts on a frequency only Grant can hear. The Doctor gets miffed because Grant broke his promise about not using his superpowers. Nardole snarks that it's like the Time Lord promise not to interfere in the affairs of other peoples or planets. After mocking Grant for not making his feelings clear to the woman he's fallen for, the Doctor notes that at least there's someone in the Universe more hopeless at it than he is. Idiot Ball: Grant knocks out Dr. Sim and flies off with Lucy without further checking into the situation, presumably because he knows the Doctor is likely on the same job. Then the Doctor, who knows that Brock is currently having his brain swapped out, also leaves to catch up with Grant. Indy Ploy: At one point, the Doctor's 'plan' consists of literally randomly mashing buttons on a spaceship console. At this point the Doctor knows the aliens are waiting for the right time to detonate the bomb, so he tries to make it explode while it's still the wrong time. In the Back: The Doctor dares Dr. Sim to do this, to mess up Sim's plan to claim he shot them in self-defence. Intrepid Reporter: Lucy goes undercover as a janitor to investigate Harmony Shoal and tells the Ghost that nearly getting shot will not deter her. The brain-aliens go to great lengths to frighten the world's leaders into seeking shelter at Harmony Shoal's facilities, while trying to eliminate the Doctor so he can't expose their scheme to hijack said leaders' bodies. Evidently, nobody's told them that letting him blow the whistle and then pulling a Body Swap on the Doctor himself would suffice to conquer the planet: as of the Season 8 finale, he's been the de facto President of Earth in the event of global alien invasion. It May Help You on Your Quest: Basically the motivation for Lucy gifting the Doctor with Mr. Huffle, though exactly how remains to be seen. It's Not You, It's My Enemies: Invoked by the Ghost when he's telling Lucy why he doesn't intend to let her know his secret identity, saying he doesn't want to risk an enemy going after the people close to him. He doesn't tell her that she is one of the people close to him. Janitor Impersonation Infiltration: Lucy disguises herself as a cleaning woman to sneak around Harmony Shoal. Jump Scare: As the villains examine security camera footage of the Doctor, he suddenly turns to the camera and shouts "Boo!" He is actually in the same room with them in the present, and has hacked into the footage just to do this and reveal himself. Kill and Replace: The modus operandi of Harmony Shoal, who empty out the bodies for their members to control. It happened to Dr. Sim shortly before the episode begins, and happens to Brock early on. They plan to do this to humanity's leaders. Lady in Red: Grant recommends that Lucy wear her red dress for her date with the Ghost. She says it's Not a Date but an interview, and appears to be wearing a coat instead. Grant/Ghost is stunned when she turns out to be wearing the dress after all. The Doctor tells Lucy and Grant that things end, which is sad, but then they begin again, and it's happy. The camera is focused solely on him for this scene, with his eyes just off-centre. He's referring to the fact that though his journey with one companion may be over, a new journey with a new companion will begin. He also says he's been away for awhile but he's back. While this is explained as him spending a night on another planet that lasted 24 years, this also references how the show went on hiatus for a year after the last Christmas Special. The title of the episode itself also refers to the preceding hiatus, with "Doctor Mysterio" being the title of the show in Mexico. Loophole Abuse: Played for laughs. The Ghost claims it's against his moral code to cause lasting harm... then knocks Sim out and claims "light to moderate injury is fine." Love Epiphany: When interviewing the Ghost, Lucy blurts that "There are few men like Grant!" and then walks off as the realization sinks in. Loves My Alter Ego: Played with. After Lucy meets the Ghost for the first time, it seems she's going to fall into the pattern of being attracted to the superhero while continuing to be oblivious to his mild-mannered alter ego. When it comes down to it, however, she realizes that it's Grant she loves, even before she finds out he's also the Ghost. Lured into a Trap: The Shoal of the Winter Harmony plan to lure the world leaders into a trap by staging an attack that destroys New York but leaves Harmony Shoal's offices standing. The Leaders will then seek refuge in the other Harmony Shoal buildings and be taken over. Made of Indestructium: The Harmony Shoal Offices are built to withstand a blast up to four times the strength of a nuclear explosion. This plays into their plan, their office will be the only building that survives the destruction of New York. Magical Nanny: Grant, sort of. He divides his time between being Lucy's nanny, and being the Ghost. He boasts that he can return home and check on the baby from anywhere in the city faster than most parents can cross a hallway. Make It Look Like an Accident: A variation. Sim intends to shoot the Doctor, Nardole and Lucy and claim he was shooting intruders. The Man Behind the Man: Mr Brock is set up as the leading villain at the start. However he is revealed to just be the Public Face for the Harmony Shoal, unaware of their real plan, and his body is taken over by one of the Shoal when he finds out about them. Dr. Sim, who has already been taken over, serves as the more direct villain. The Shoal also plan to be this for Earth's leaders after taking them over in one fell swoop. Meaningful Name: Played with - when Lucy has her Love Epiphany about Grant, she verbally berates herself for taking him for "Grant"-ed. Meta Guy: The Doctor's reaction to the Two-Person Love Triangle is this, to the point where he nearly spills the beans on the whole thing because he thinks it's stupid. Mistaken for Gay: Lucy gives voice to the notion that the Ghost is gay, what with him dressing in leather and flying around with a big "G" on his chest. Monumental Damage Resistance: The Harmony Shoal building will be the only one that survives New York's destruction... leading to the other Harmony Shoal buildings being used as places of refuge by the leaders. Morally Ambiguous Doctorate: Dr. Sim... though he is really a member of the Shoal who has taken over the body of the real Sim. Mundane Utility: The Ghost lights a candle with a snap of his fingers. The Doctor gripes that he always seems to be stopping an alien invasion on Christmas. Grant: Life's not a comic book. Right, Doctor? The Doctor: Possibly, I'm not the right person to ask. 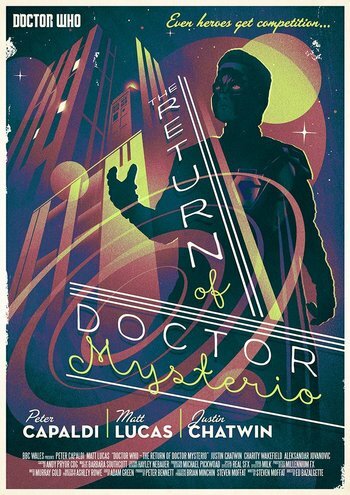 As mentioned below, the title means "The Return of the Doctor". "The Doctor Returns" was a Working Title for "The Eleventh Hour". The Namesake: The title is explained when Grant says that if the Doctor was a comic book superhero he would have been called "Doctor Mysterio". The episode's title effectively means "The Return of the Doctor", which is fairly accurate in and out of universe. It takes a few tries for Nardole to accurately materialize around the Doctor. In one of those tries, he becomes Emperor of Constantinople in the twelfth century. He "ruled firmly, but wisely." Although the events of the preceding episode are known, we still don't know what happened during those 24 years, including exactly how Nardole was made whole again. All we get is Nardole needling the Doctor for needing someone's company. Oblivious Guilt Slinging: "The Ghost" is on the verge of telling Lucy his secret identity, only for her to start thinking aloud about how Grant has never lied to her in all the time she's known him. He promptly loses his nerve. Oh, Crap! : Nardole notices the Doctor puts on his "I am going to mess stuff up and press random buttons and hope stuff doesn't go BOOM!" face. He's right to panic. Parental Neglect: Even though he's her nanny not her father the Doctor invokes this when he points out Grant is leaving a baby alone. Playing with Fire: The Ghost is apparently able to light candles at will. Popcultural Osmosis Failure: What happens when the Doctor reads a Superman comic book. He comes to the shocking realization that Superman and Clark Kent are the same person! Power Incontinence: Teenage Grant can't turn off his X-Ray vision. As he puts it, "I'm in Hell. Naked Hell." Power Perversion Potential: Grant as a teenager discovers he has X-Ray vision, which the Doctor explains as the gemstone giving him what it thinks he wants. Unfortunately, he can't turn it off. Reality Subtext: The title of the episode, and the Doctor's line "I've been away for a while, and now I'm back" are references to the show having taken a year-long hiatus in-between the previous Christmas special and this one. In-universe, Nardole explains that the Doctor has just finished his 24 years spent with River Song on Darillium. Reality Warper: The gemstone Grant ingests takes his desire to be a superhero and turns him into one, regardless of the laws of physics. Real Men Wear Pink: The world's first and most powerful superhero has a day job as a nanny. Funnily enough he doesn't seem to think it's a big deal, but Lucy gets defensive about it to the Ghost (even though she brought it up). Recycled Script: Aliens that wear the skins of their victims and plan on taking the place of human leaders by engineering a crisis in which they crash a spaceship into a major city: this story, and also "Aliens of London". Safe Zone Hope Spot: Invoked. The Harmony Shoal intend for their buildings to be this for the world leaders, who will flock to them for safety and be taken over. Samaritan Syndrome: The Ghost suffers from this. The Doctor asks him when he takes any time off, and despite his claims that he does, it is obvious that he doesn't. The Doctor, of course, is uniquely qualified to identify the symptoms. Santa Claus: The Doctor is mistaken for this by the young Grant — as their encounter happens to be on Christmas Eve. Sarcastic Confession: Played with when Brock tells a roomful of reporters that his mysterious investors have been murdered. Turns out he really is being sarcastic, and it's the investors who are doing the murdering. UNIT takes down the alien operation, but at least one brain escapes in a UNIT trooper's body. Grant keeps his superpowers at the end, even though he retires as The Ghost. Which opens the possibility of him returning in the future. And return he does, in a comic book!. Shooting Superman: Sim continues to empty his gun into the Ghost after it becomes obvious that bullets are bouncing off him. The gemstone that gives Grant his powers is said to use power from the nearest star, a reference to how Superman is powered by Earth's yellow sun. The Harmony Shoal building has a globe with the company's name wrapped around it on the roof exactly like the Daily Planet building does in the comics. At the end of the press conference Mr Brock tells the audience that 'Ms Siegel' and 'Ms Shuster' will take care of any further questions. In an in-universe shout-out, Grant describes himself as "mild-mannered", an adjective frequently applied to Clark Kent. The missing Mr. Lombard, who ran out on Lucy after their child was born, might be a reference to Steve Lombard , a meathead sports reporter at the Daily Planet who often served as Clark Kent's foil. Nardole, being bald and the way he is dressed, bears more than a passing resemblance to Lex Luthor but this is subverted in that he's not a Big Bad, but instead the Doctor's companion. Even Harmony Shoal's modus operandi could be a shout-out to Superman's first Golden Age nemesis, the Ultra-Humanite , who similarly had a habit of transplanting his brain into other people's bodies. The Doctor sets loose a bunch of Pokémon to keep the employees of Harmony Shoal's Tokyo branch occupied. The Doctor reminds Grant that With Great Power, Comes Great Responsibility. Young Grant's room is plastered in decor from both Marvel Comics and DC Comics. The Doctor also reads an era-appropriate Superman comic (from John Byrne's iconic 1980s run) in Grant's room. The Doctor claims that Grant is actually left handed when Grant holds up the ship-bomb with his right hand. Grant's "The Ghost" mask looks an awful lot like the one worn by Kyle Rayner. Staging an alien attack on New York to scare the rest of the world into capitulation is the villain's plan in Watchmen. Grant once spins to change into the Ghost costume, akin to Wonder Woman. The superhero gets mistaken for gay by his love interest. Except, this time, it's his cover identity, not the regular one. The title of the episode is a real-world shoutout to the fact that this is the title given to the series in Mexico ("Misterio" means "Mystery" in Spanish). Word of God (Steven Moffat) is that the title was inspired by Peter Capaldi when he learned of this during a publicity visit to Mexico in 2016. When the Doctor utters the name in the episode, he does so using the same intonation as that used by the announcer on the Mexican broadcast. The establishing shots of New York City at the beginning have a definite [[Film/Batman Gotham City]] flavor to them. Single Woman Seeks Good Man: While Lucy is literally swept off her feet by the Ghost, it is Grant's reliability and kindness in comparison that triggers the Love Epiphany. Skewed Priorities: When he and Nardole are trapped on a spaceship diving towards New York and Nardole is being attacked by a security drone the Doctor tells him not to worry... the ship will blow up long before he's been strangled to death. Slasher Smile: Nardole knows that when the Doctor gives a nasty grin, he's going to do something crazy. Something Else Also Rises: When the Doctor mentions Lucy to teenage Grant, Grant unconsciously levitates several feet off the ground while his hands are in his lap. Special Edition Title: Averted, unlike the Twelfth Doctor's two previous Christmas specials. Probably because this one's not Christmassy at all. Spell My Name with a "The": Grant calls himself "the Ghost" as a superhero. Storming the Castle: Happens at the end when UNIT takes over the Head Office of Harmony Shoal. Straight for the Commander: Played with. The Shoal's plan is to take over the leading people of Earth... hence why their first attack will be them not attacking a capital city, but New York. This will make the leaders scared enough to go into the Harmony Shoal buildings for protection, whereupon they will be taken over. Superman Substitute: "The Ghost" is more a homage to Superman and in general comic book heroes than just a Captain Ersatz of him. Played with. As Dr. Sim is reviewing the camera footage of the Doctor, the Doctor talks to them directly from the monitor. Then he triggers the lights and reveals he was just toying with the camera footage from across the room. Dr. Sim does the same thing to the Doctor later. The Doctor: Remember what he said, the scary little German fella? Dr. Sim: (on screen) This building can withstand a blast up to four times the strength of a nuclear explosion. The Doctor: Oh, this is very good, very meta. Tempting Fate: The Doctor assures his sidekick that the security mooks will have fled the crashing ship, so that gives them a clear run to the TARDIS. Cue arm coming through the partly-open door and strangling Nardole. This Is Reality: The Doctor has this reaction to Spider-Man's origin, claiming that a radioactive spider would just kill him. Nardole: And what's plan B?! The Doctor: I have no idea, but it's going to be a very big relief when I think of it. Time Skip: From the Doctor's perspective, it's been 24 years after the events of the previous episode and it's implied that this is his first (solo-ish) adventure in that length of time. Title Drop: The Doctor considers "Doctor Mysterio" as an alias, justifying the use of the title. Two-Person Love Triangle: Grant is in love with Lucy, and Lucy is interested in the Ghost until she realizes that she really loves Grant. It's played with when Grant tries to beg off tending Lucy's baby by claiming he has a date. Lucy immediately gets jealous, not realizing the "date" is with her: she'd just arranged to interview the Ghost. So both characters get to be jealous of themselves, making it a two person love square! Two-Timer Date: Grant has to be the Ghost for an "interview" with Lucy, but also has to babysit her baby downstairs during this date. Unbalanced by Rival's Kid: Averted, Grant is no doubt a better father for Lucy's baby (just by being there) than the father who walked out on them. Unexplained Recovery: The Doctor procured a new artificial body for Nardole and disconnected him from King Hydroflax's robot body, but the story behind it is a total blank. The reasons, however, are not, as the Doctor rebuilt Nardole with a body like his old one if only as a transparent excuse to find himself new company on the TARDIS and guilt-trip Nardole into coming along out of gratitude. Admittedly, Nardole finds this decision to reconfigure him fueled mostly by selfishness and shallow motivation on the Doctor's part, but goes along with it out of pity more than anything else (and, later, because River told him to). Unusual Weapon Mounting: Brock keeps his pistol concealed inside his head. Villain: Exit, Stage Left: As UNIT raids Harmony Shoal, the head alien jumps from Sim's body to a Red Shirt and simply walks out. What Happened to the Mouse? : At the beginning of the episode, Grant gets superpowers by inadvertantly swallowing a vital component of the time distortion stabilizer the Doctor is building. From that point on, Grant and his superpowers become the focus of the episode, and it's never mentioned how (or indeed if) the Doctor got the device working without the irreplaceable component. What the Hell, Hero? : The Doctor pulls one on Grant early on when he discovers he's the Ghost, and a nanny taking care of a baby. He tells him that with great power Comes Great Responsibility and says that a super-powered being who goes off to do heroics while leaving a baby unattended is no hero at all. Grant not unreasonably points out that he has a baby monitor on his belt, and can cross the city to check on the baby faster than any ordinary parent could cross the hall to do the same. Would Hurt a Child: Lucy says that Brock can't kill her because she's his only hostage, and he reminds her that her child is a few floors down. Grant returns in his civilian form before Brock can carry out his threat, though. The X of Y: "The Return Of Doctor Mysterio", the 127th example of this on the series. Your Cheating Heart: Lucy's ex-husband and Grant's former best friend left his pregnant wife for another woman. Justified as Plan B involves the Doctor crashing a spaceship into New York and hoping the Ghost will stop it. Nardole: You are completely out of your mind! The Doctor: How is that news to anyone? When the Doctor is confronted with Grant's double life. The Doctor: Grant, this is insane. Look, I'm me, the Doctor, and even I think this is insane. You Wouldn't Shoot Me: Played with. The Doctor, Nardole and Lucy turn round to prevent Sim shooting them, as that would ruin his story that he was shooting intruders. Doctor Who S35 E11 "Heaven Sent"
Doctor Who 2017CS "Twice Upon a Time"
Doctor Who 2015 CS "The Husbands of River Song"
Doctor Who S36 Short "Friend from the Future"
Doctor Who S36 E1 "The Pilot"